Any one own a Muzzel Brake? If so is it worth it? SMG sells one for about $150 and Dinzag sells one for about $35. If you want the barrel threaded then the AK74 brake is excellent for $20-40. If not SGM is it, I have both on rifles and both work very well. Some higher tech compensators out there but cant say they are work all that much better than the AK74, its a good brake. I recently threaded both of my 308's, one has a 16" barrel and the other has a 22" barrel. I purchased a JP Enterprises Bennie Cooley Tactical muzzle brake (5/8-24 .750 outside diameter) and installed it on my 16" 308. I took them both to the range last weekend to site them in before re-pinning the front sight. While shooting the 16" with the brake on it, I was amazed at how little recoil there was from it and I was able to stay on target while rapid firing. I switched to my 22" 308 to make sure the front site was properly lined up and holy hell was there a difference in felt recoil. I switched back and forth between the two and couldn't believe how well the brake tamed the 16" barrel. I have since purchased the same brake for my 22" Saiga which should arrive by Friday. On a side note, anyone standing next to you on the firing line will promptly step back due to the increased report and shock wave caused by the brake. I haven't tried any other brakes so I don't have anything to compare them to but I'm very pleased with it. If you're considering threading your barrel, use a 5/8-24 die as you will have a larger selection to choose from. Good luck. My barrel is already threaded. Thank you both for the excellent info. I recently threaded both of my 308's, one has a 16" barrel and the other has a 22" barrel. I purchased a (5/8-24 .750 outside diameter) and installed it on my 16" 308. I took them both to the range last weekend to site them in before re-pinning the front sight. While shooting the 16" with the brake on it, I was amazed at how little recoil there was from it and I was able to stay on target while rapid firing. I switched to my 22" 308 to make sure the front site was properly lined up and holy hell was there a difference in felt recoil. I switched back and forth between the two and couldn't believe how well the brake tamed the 16" barrel. I have since purchased the same brake for my 22" Saiga which should arrive by Friday. On a side note, anyone standing next to you on the firing line will promptly step back due to the increased report and shock wave caused by the brake. I haven't tried any other brakes so I don't have anything to compare them to but I'm very pleased with it. If you're considering threading your barrel, use a 5/8-24 die as you will have a larger selection to choose from. Good luck. 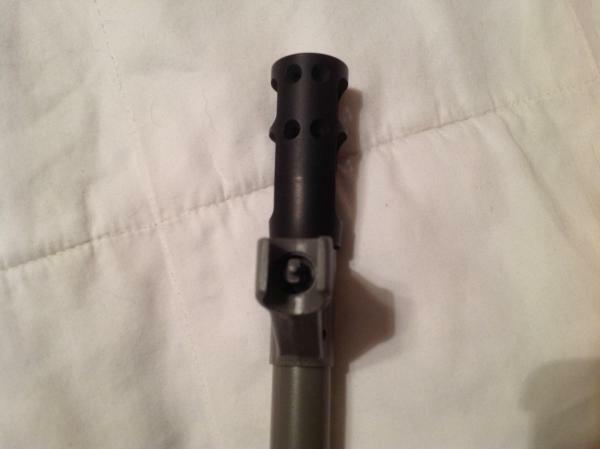 Will the stock threads on my Saiga .308 fit JP Enterprises Bennie Cooley Tactical muzzle brake? Any idea of the thread pattern? I would imagine without any work done to the barrel to reduce its diameter it would be threaded in 17x1 or if it has the smaller diameter barrel under the front site block it could be 5/8-24. I have a brake called "Mantis" on my S 308. Have shot 300 rounds at one sitting with no after effects to my old bones. 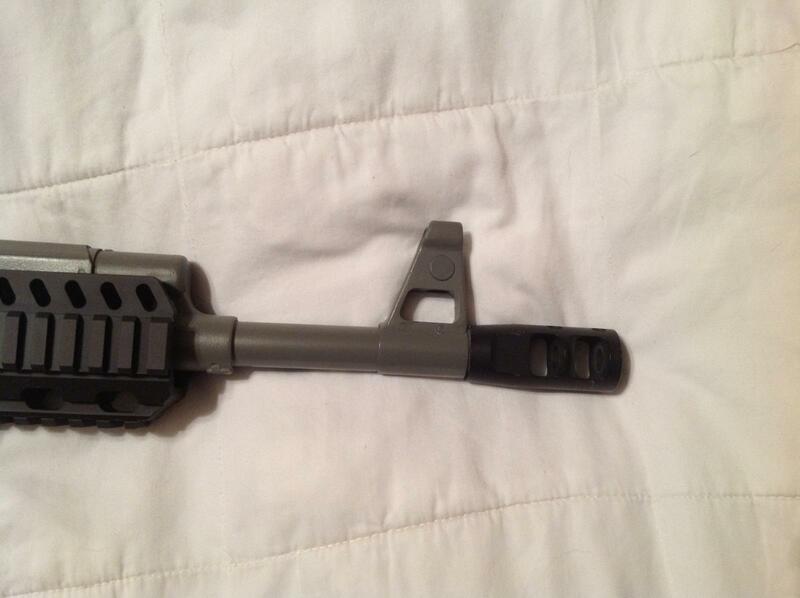 It will throw a huge fireball and is as loud as a .50 cal Barrett. You won't make any friends at the range! It might be loud, but not the same as a 50. When you can clean off the bench next to you with brake blast, THAT's loud!